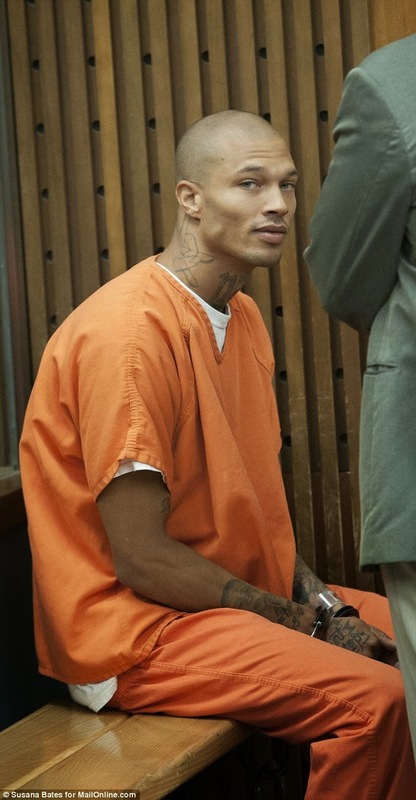 Jeremy Meeks, the alleged gang member who became an Internet sensation after his handsome mug shot was posted on a police Facebook site, is in talks with top designers to dress him during his trial, his attorney told MailOnline Friday. Tai Bogan, known as the Pitbull because of his ‘aggressive’ style of defense, has been secured by Meeks to represent him against gun and gang related charges. 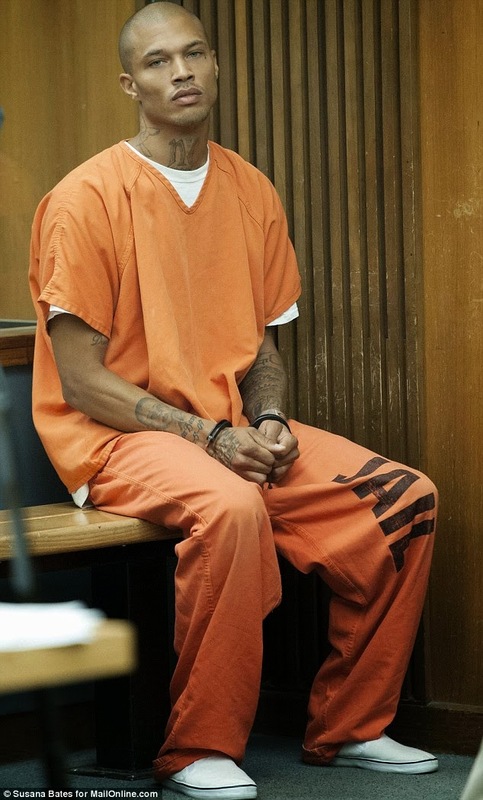 During the five-minute hearing at San Joaquin County court in Stockton, California, Meeks, 30, was forced to wear a regulation orange prison jumpsuit and have his hands shackled. Bogan said that it was important that his client looked as ‘good as possible’ before a jury and to that end the family were close to signing designers to cloth him during his court appearances. The lawyer, who is being paid with money raised through a family Gofundme page, spoke to MailOnline after his client appeared in court for a second time. Bogan asked Judge Franklin Stephenson for permission for Meeks to wear civilian clothes during future preliminary hearings. He said that because his picture was posted ‘millions and millions’ of times on the Internet, it was prejudicial against a fair trial for him to be ‘in handcuffs and prison garb’. Judge Stephenson declined the motion claiming it was in the best interest of security for Meeks to be shackled. However when Meeks finally appears before a jury for trial, it is the law that he will be able to wear his own clothes, said Bogan. After the hearing, Bogan said: ‘We are talking to designers to provide clothing for him during this case. His comments came after it emerged Meeks, whose image was shared 89,000 times when it went on the Stockton Police Facebook page, has landed a Hollywood talent agent. Gina Rodriguez, who has guided Nadya ‘Octomom’ Suleman and V. Stiviano, the woman at the center of the Donald Sterling scandal, now represents Meeks, whose chiseled features and blue eyes caught the public's imagination. While Tom Ford is not dressing the hunky prisoner, 'the modeling management we are working with has a stylist who was going to dress Jeremy in a Tom Ford suit,' she told MailOnline. Rodriguez defended her representing Meeks Friday. ‘Everybody has a story, and I, of all people, know that,’ Rodriguez told FOX411. ‘If this was a different situation, like if someone was actually hurt or there was violence involved, I definitely would not be taking him on. Meeks, a married father-of-one, is currently being held in the San Joaquin County Jail on seven felony counts related to firearm possession, street gang membership and parole violations. His bail is set at $1m. Rodriguez said she is in talks with four production companies and three different modeling agencies. Earlier this week police raided the home Meeks shared with his wife, a nurse, and mother Katherine Angier. His attorney said that they smashed down the door even though they had keys and he is confident that the gang related charges would be dropped. Meeks stole the hearts of women around the world after police put his mugshot on their Facebook page following his arrest on five weapons charges and two gang-related offences during raids targeting gangs in Stockton. Officers later claimed he is one of the most violent criminals in the Stockton area and belonged to the Northside Gangster Crips gang. After court Ms Angier, who was carrying a suit for her son, refused to comment. But earlier this week she exclusively told the Mail that he had nothing to do with the gang anymore and was ‘desperately’ trying to go straight. She insists that he was 'innocent' of any violent crime and that he was only arrested because of his 'old' gang-related tattoos. He has ‘NC’ for 'Northern Crips' tattooed on his neck and a teardrop coming from his left eye - accepted as a marker for having killed someone or spent a long time in jail. 'He got away from the gangs when he met his wife and they got married six years ago,' she said, holding back tears. His popularity on the web had caused him problems with the guards and other gang members in the jail, she said. Ms Angier said that the 30-year-old had been desperately trying to 'go straight' and that he had held down his job in a workshop for a year. But she confirmed that her son, who has striking blue eyes, had been made 'many, many offers' for movie and modelling work. 'It could end being a good thing,' she said. The mother said that her son’s wife, who does not want to be named, is 'shell shocked' and petrified she will lose her job as a nurse. 'She’s the main breadwinner,' she said. 'She has trained for five years to get this job. She just wants him back. She knows he’s innocent. But she’s worried this could lose her her job. The family Gofundme site, which is aiming to raise $25,000 for his defense, has currently had pledges for $4,970. 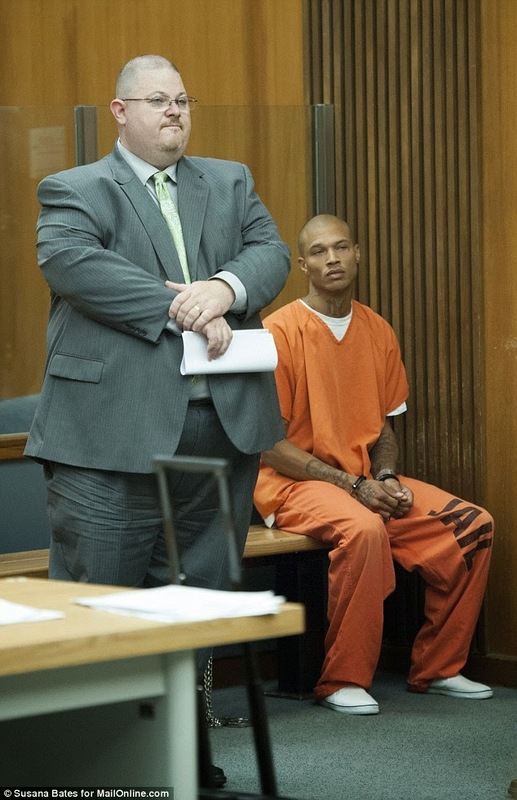 Meeks is due to appear before court again on July 8th.